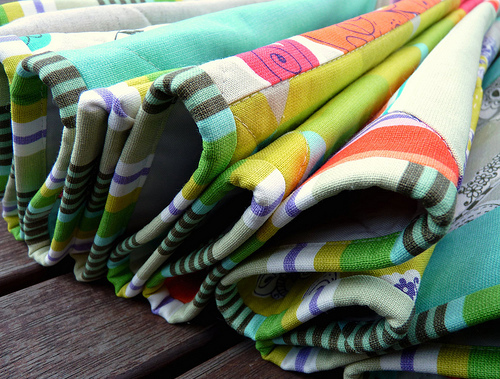 Back in August the Sydney based Prints Charming girls, Kirsten and Cath, emailed me to see if I would be interested in having a little play with their new fabric collection. Of course, that's a no brainer! Yes, yes, fabric always received with open arms! spots and stripes decorating their world. and strung from tree to tree chains of daisies brighten up the rose tinted skyline." I've tried to incorporate many of the fabrics in the range to make the quilt, and have made a feature of my favorite prints - those gorgeous birds. Daisy Chain is 100% cotton fabric, and it is a heavier weight fabric - canvas - suitable for all home decorating applications, and also quilts! I encountered no problems with the patchwork piecing, basting and quilting of this quilt - in fact I think it was easier to baste as there was little stretch in the quilt top. I finished the quilt with a stripey binding fabric also from the Daisy Chain collection. This quilt is going to be well traveled, having already spent some time in Sydney, it has since made it's away across to Purl Soho in NYC where the Prints Charming girls are teaching this week, and will then make it's way to the Houston Quilt Market to be part of the Kokka booth. Gorgeous, Rita. I love how you mixed it up with different blocks and left some so simple to let the fabric speak for itself. Lovely composition! great! Love those striped blocks. Love it. The birds are very sweet! I love it and those birds, so perfect!!! Omg I'm in love. I need some of that fabric now! How awesome that it's getting a world-wide "showing". Beautiful quilt Rita, love it, and congratulations that it will be hanging in Houston! Thanks for the Fabricworm tip - I've just nipped across and bought a FQ set in pink and an extra yard of the pink birds ... thinking maybe a bag ... we'll see. 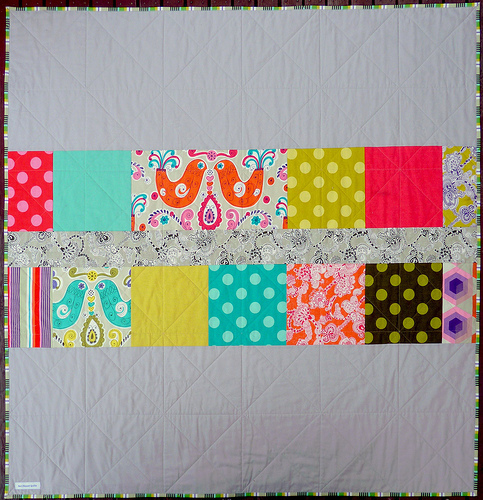 Pinned your quilt on Pinterest too! Cat. What fabulous colours! I really like that range. It appeals to the 70s throwback in me. Beautiful fabrics, well shown in this quilt. I have two questions. 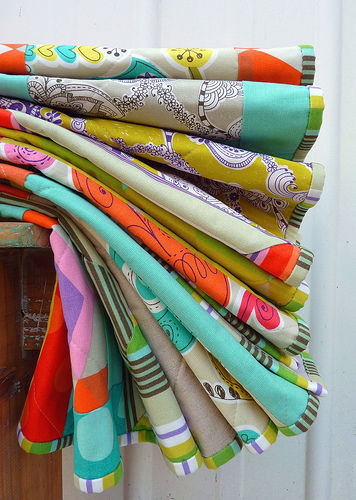 How did you get started making up quilts to show new fabric lines? I would love to do this, but so far no one is sending me their fabric. 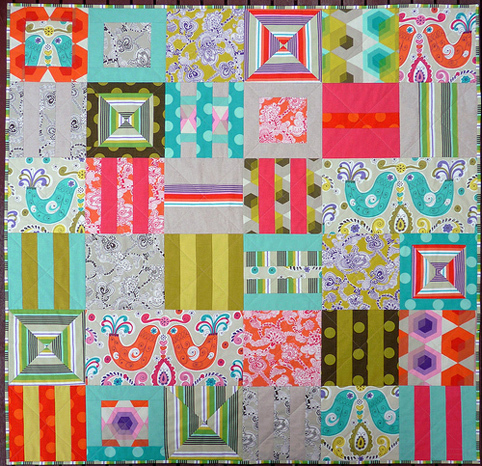 The pieced backs- how do you get them to line up perfectly w/ the front so that the straight line quilting looks good? I have tried placing the insert so that it doesn't hit straight quilting lines (but I know yours must), and used lots of pins, but have had mixed success. What is your trick? Thanks! i love this one! very unique and eye-catching! i agree! the birds are gorgeous! and the quilt highlights them beautifuly. can't wait to get some of that fabric! I love it, really love it! I bet Kirsten and Cath are over the moon with this beautiful rendition of their fabrics. Clever all around! Very nice! I love that bird fabric too. Gorgeous quilt. Don't you wish you were travelling with the quilt? Your quilt is SEW lovely. When a quilt has such lovely fabrics, people want to take time and look - like a great view. That is great! I have been scouring the internet to find the maker/pattern for this quilt ever since I saw it in my Fabric Worm email flyer! If you don't mind me asking, how much fabric did you use?, and would you put the pattern in your etsy store? pretty please?